Our nationally-accredited Summer Day Camp offers the most unique experiences in the area! Every day our campers visit multiple sites, providing fun twists and turns throughout the day. What do campers gain from camp? Plenty! It helps build confidence, independence and responsibility. Watch your camper blossom as they meet new people while developing social skills, patience and manners. Our camp offers arts & crafts, archery, nature hikes, canoeing, kayaking, fishing and more. Worried about finding time for swim lessons? Swim lessons are included in our camp fee and conducted by our certified swim instructors. Each one week session includes an exciting field trip and special theme event. Your camper is sure to come home exhausted after a full day of happy experiences! Swim lessons are included in camp - no extra fees! Browse the digital guide to plan your schedule, click on the program code to go directly to online registration. create your summer fun with us! The Junior Leader Program is a great way to introduce the concept of mentoring younger campers. Emphasis is placed upon developing a sense of responsibility and the concepts of working with children. 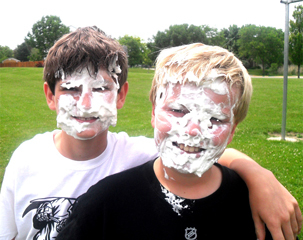 Junior Leaders assist campers with arts & crafts, games and encourage campers to participate in camp fun. Participants in this program may also submit their program hours for consideration for National Honor Society. Our Counselor-in-Training Program is designed to offer qualified young people an opportunity to prepare for positions as camp counselors or recreation leaders. Participants in this program may also submit their program hours for consideration for National Honor Society. Emphasis is placed upon developing leadership skills, improving self-confidence and assisting children in a camp environment, all while experiencing the fun associated with day camp. Counselors in Training will begin each morning at the beach and then follow their respective camps back to their assigned afternoon site. NEW! Camp orientation / parent meeting held at Main Beach on Thursday, May 30 from 7-8 pm. Campers will meet their counselor, get their t-shirt and practice arrival and dismissal. All campers must be toilet trained. Field trips, swim lessons, bussing, Fourth of July parade, T-shirts, overnights and special events are included in the camp fee. Children should be registered for programs according to the age they will be when the program starts or the grade they will enter in the fall of 2019. Summer camp fees are NOT transferable to any other program. To ensure proper camper to staff ratios, your child must be registered for Camp and Extended Time Camp a minimum of one week in advance and paid in full. Any cancellation will result in a $25 per session service charge. Once registered, you will receive an email invitation to fill out emergency forms online through campdoc.com. This needs to be done before your child may attend camp. This system will give our camp supervisors and directors instant access to required emergency forms. The security, confidentiality and privacy of your camper's personal information will always be protected. Only select Crystal Lake Park District personnel will have access to camper information and the campdoc.com site is secure and encrypted for your protection. If you are having trouble accessing campdoc.com, you can email help@campdoc.com or call (734) 636-1000. A healthy camp really does start at home. Here are some things you can do to help your child have a great camp experience. This article co-written by Crystal Lake Park District Recreation Supervisor, Sandra Thompson. Campers will get a key chain fob to swipe in each day! If punch pass was purchased online, parents will need to come to the administration office to pick up the key chain fob before children can attend camp. Scanners will be located in the beach office or next to ET sign-in sheets. The punch pass option allows campers to attend ten camp days throughout the 10-week sessions. Each sibling will need their own pass for this new system. The fob will not scan twice in one day. If you lose your fob, there is a $5 replacement charge. Smaller passes are available for the last week of camp. PASS USAGE CAN BE SEEN ON YOUR CLPD ONLINE ACCOUNT. Campers enrolled in Extended Time have the option of adding mornings, afternoons or both to the regular camp day. Extended Time campers have breakfast at 7:30 am and enjoy a snack in the afternoon. ET camp activities include crafts, group games, outside play and an occasional movie. Extended Time Camp opens at 6:15 am and closes at 6:15 pm. Campers enrolled in Extended Time Camp begin each day at camp sites and are bussed to Main Beach at 8:30 am. Campers may sign up for AM, PM or BOTH based upon individual needs.